A parent in the nest regurgitating food for an already fairly large chick. Both parent will regurgitate for the chicks. The climate in South Shetland is warmer than in the Antarctic Peninsula, and it was fairly visible in the fact that the penguin chicks here were much larger than the ones I saw in the Peninsula. 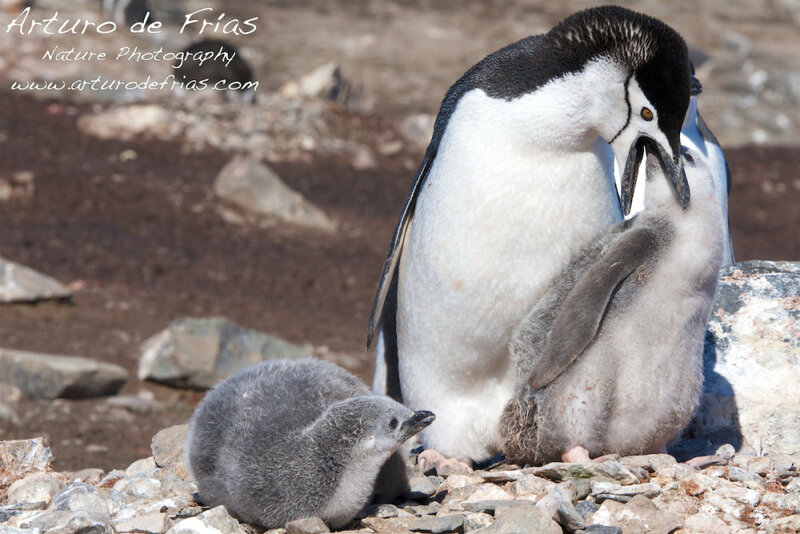 Pingüino Barbijo (Pygoscelis antarctica) regurgitando alimento para sus crías. Aunque ya tienen un tamaño considerable, las polluelos no tienen más de 40 días. Las Shetland del Sur están 100 kilómetros al norte de la Península Antártica y disfrutan de mejores temperaturas, con lo que hay enormes colonias de pingüinos.